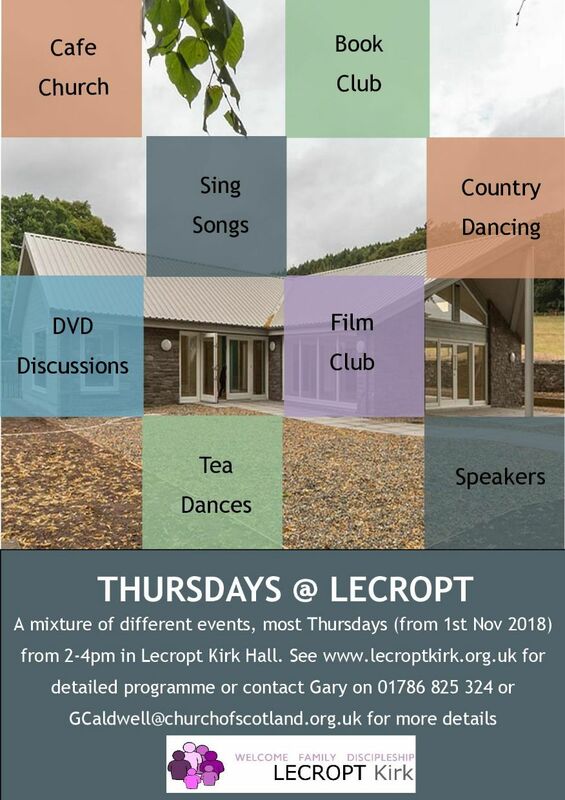 Thursdays @ Lecropt is on most Thursday from 2-4pm in Lecropt Kirk Hall (which has ample parking). It is an opportunity to get together with people to worship, discuss, learn or dance and above all to simply enjoy other people’s company. We hope you will find something of interest in our programme and come along to some or even all of the sessions. Thursdays @ Lecropt is free although there will be an opportunity to give a small donation if you want to do so. Cafe Church - An opportunity to worship in a relaxed way over tea and coffee. Exploring the God Question - Six half hour episodes, world renowned contributors from both sides of the science/God debate unpack the evidence found in the Cosmos, Life and Evolution and the hidden depths of Mind and Consciousness. Book Club - Bring along your favourite book, share why you love it, hear about other books and maybe meet a local author or two. Carols and Country Dancing - spend some time singing and dancing - numbers may be limited at this session. New and Old Hymns - come along and sing old favourite hymns and learn some new ones. Tea dance - Have a cuppa and enjoy getting on the dance floor - numbers may be limited at this session. Table Talk - Let's discuss what we think about things. Crafts - Let's have fun making things together.